Create a small landscape quilt working in layers, using a collage method. Learn to incorporate unusual fabrics and embellishments to create gorgeous effects. Explore embellishing techniques to add texture, depth and dimension to your landscape. 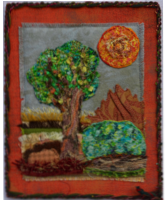 Learn how to work with a variety of fabrics and fibers while creating a tiny landscape that is a feast for the senses. Fabric manipulation, embellishing and a layered fiber collage technique are featured in this class. Each landscape is a unique work of art! 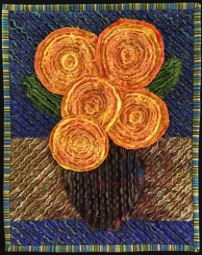 Learn the techniques for creating dimensional flowers and leaves and applying them to a quilt. The process of combining blooms, leaves and stems to construct flowers will be presented to create an original Wildflowers wallhanging. Learn the techniques for creating dimensional flowers. Make your own wildflowers to later add to a quilt, accessory or wearable item.